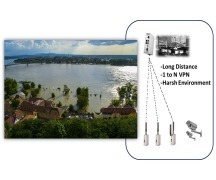 To construct a complete onboard surveillance solution, the products applied must be able to provide reliable data transmission, resist to harsh environments, and easy to be deployed. 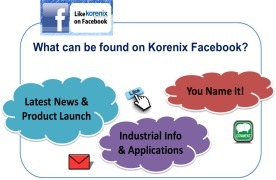 Korenix has launched Industrial PoE Switches JetNet7714G-M12, JetNet6910G-M12, and Industrial Wireless AP JetWave2450 to meet the market expectation. 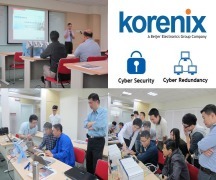 Install Korenix JetNet7714G-M12 which has passed railway rolling stock standard –EN50155 on the driver/tail car and JetNet6910G-M12 which supports 2 types of power specification- DC110V and DC24V for different train power system on the passenger car. 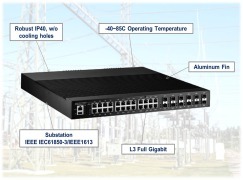 Connect all the switches together through Gigabit ports can form a Gigabit network redundant Ring which highly strengthen the network redundancy. With these two devices working together, the cameras on the train can be continuously power fed. At the meanwhile, the devices transmit video images and store them in the NVR. When the train approaches the stops, the switch will automatically search for the right IP through layer 3 routing function and transfer the data to the stops and further to the control center through the wireless device JetWave2450. 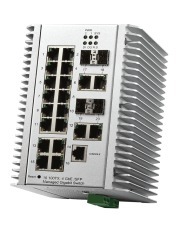 Apply Korenix Industrial PoE Switches JetNet7714G-M12, JetNet6910G-M12 and Industrial Wireless LAN AP JetWave2450 to create the most reliable Train IP Surveillance application now!